For many, there’s an enormous appeal to unboxing a “new” instrument that looks, feels, and maybe even sounds like a well played-in companion. I can see why the process of aging a new guitar might seem crazy to some, but when it’s done right I love the results. And Danocaster does it right. Any Telecaster fan who doesn’t utter an awestruck “oooh” when removing this Single Cut from its gigbag has got to be a little frosty in the soul department. My own most immediate reaction was that I just wanted to get my hands on it. And that, I’d say, is a sign that something has been done right. Closer examination of this double-bound early-’60s spec’d Single Cut in Firemist Silver revealed that a lot of things have been done right. Danocaster—a five-person operation in Nashville, Tennessee, headed by Dan Strain—acquires its bodies and necks pre-cut from a U.S. supplier, but all are exclusive and done to custom specs derived from Strain’s own collection of vintage Fenders. Detractors might call it a “partsocaster operation,” but we could have accused Leo Fender of the same. Think of it like this: Danocaster is the final neck shaping, assembly, finishing, setup, tone injection and QC department of a guitar maker that has its wood shop located in another building. However you slice it, the results speak for themselves: I have played seven Dano Double and Single Cut guitars to date—including the three Single Cuts they sent from which we selected one for this review (see web-only reviews of the other two on GuitarPlayer.com)—and all have been stellar. This one has a solid, ultra-lightweight, two-piece swamp ash body and a flamed maple neck with an impressively dark rosewood fretboard. The low 6.8 lb finished weight of the guitar speaks volumes, as does the feel in the hand. Eyes closed, I’d swear this was a 50-year-old neck: rounded C profile, enough thickness to grab onto (.830" at the first fret in this case), rolled fingerboard edges for a sweet feel, immaculate fret dressing, and a subtly original headstock shape. This impression is enhanced by careful French polishing of the neck back, while the body’s thin nitrocellulose finish displays a sultry yellowing, natural-looking weather checking and subtle scuffing that adds personality. Plugged into a Vox-style dual-EL84 15 watter and a custom JTM45-style head and 2x12 cab with Scumback and Celestion speakers, the Single Cut performed entirely like I’d expect a great early ’60s T-style to do. The Budz pickups have a great blend of bite, clarity, complexity, and twang in all positions. The bridge nails bright country chicken-pickin’ with ease, yet it’s meaty enough to avoid any ice picky treble, and rocks out with confidence with the amp cranked or a Gas FX Drive Thru overdrive pedal kicked in. 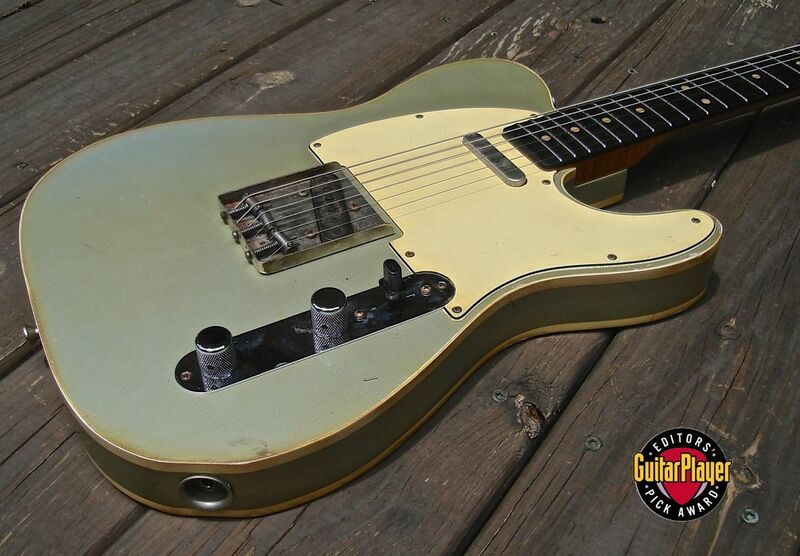 Man, there’s nothing like a great T-style bridge pickup, and this Dano quickly re-establishes that fact. The middle position is round, sweet, and musical—slightly polite even in a useful way—while the neck pickup has more clarity and depth than that of many T-styles, while affording plenty of jazzy warmth and richness too. All in all, this is a superbly enjoyable guitar, a great value for the serious mojo it delivers, and thoroughly deserving of an Editors’ Pick Award.